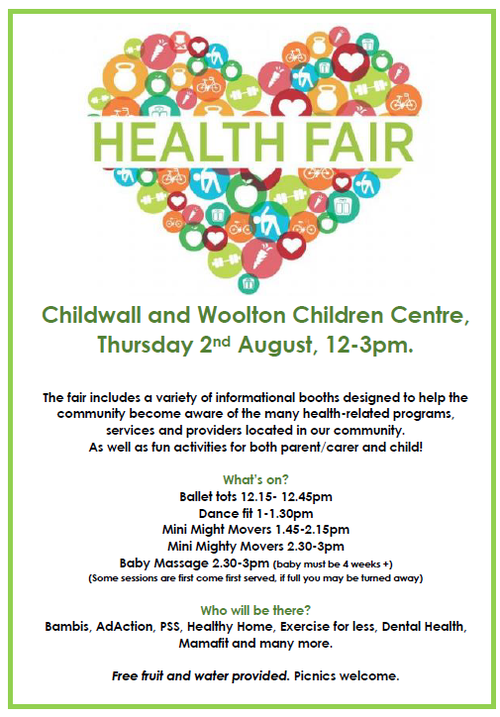 Childwall and Woolton Children Centre, Thursday 2nd August, 12-3pm. The fair includes a variety of informational booths designed to help the community become aware of the many health-related programs, services and providers located in our community. As well as fun activities for both parent/carer and child! Bambis, AdAction, PSS, Healthy Home, Exercise for less, Dental Health, Mamafit and many more. Free fruit and water provided. Picnics welcome.